Dr. Michael Weinstein, a trauma surgeon at Jefferson Health in Philadelphia, has suffered from depression for much of his life. Although he has received treatment throughout his two-decade career, Weinstein never discussed it with his colleagues, fearful they would perceive him as weak. “It was something I hid because of the associated stigma and also lack of awareness that many people in the profession would potentially be having similar types of issues,” he said. Then, in 2016, it got worse. Seemingly out of nowhere, he fell into a deep depression. It was so bad, he began to contemplate suicide. His wife forced Weinstein to see his primary-care physician, who convinced him to take a leave from work and admit himself to a psychiatric facility, where he underwent electroconvulsive therapy. “I needed someone to tell me to stop working. It was the fear of telling people I couldn't do this anymore, it felt like a sign of weakness or my own failing,” Weinstein said. The fear he felt to discuss and seek help for his suicidal thoughts is believed to be common among physicians and the major reason why experts believe doctors experience higher rates of suicide than the general population. Questions on medical licensure applications about past and current mental health conditions discourage physicians from seeking help out of fear they'll lose their jobs. Additionally, a pervasive culture ingrained since medical school—where physicians are told to be strong and put the health of their patients before themselves—only adds to the pressure. “There is almost this macho culture that you might find in law enforcement and the military that physicians can relate to—that you have to tough it out,” said Dr. Christine Moutier, chief medical officer at the American Foundation for Suicide Prevention who has written extensively about physician suicide. Physician suicide has been a problem in healthcare for decades. Studies dating back to the 1920s show that physicians suffer from suicide at high rates. Physicians with mental health conditions have long been discriminated against and suicides have often been kept hidden from colleagues and the public. The difference in the past few years is that the industry is responding. Recent concerns around burnout have pushed organizations to rethink how they approach physician well-being, which has led to more action around how to deal with physician mental health concerns and suicide. How many physicians actually die by suicide every year is not known. The uncertainty about the suicide rate isn't unique to physicians. The death investigation system in the U.S. doesn't have a uniform reporting system. Coroners, who are elected county officials, aren't required to have medical training or report the occupation of the deceased. And how the suicide occurs makes a difference in how it's reported, said Dr. Michael Myers, a professor of clinical psychiatry at SUNY-Downtown Medical Center in New York who has studied physician suicide. If the suicide is public, such as when a doctor jumps to his death, it's more likely to be reported as such. But if it occurs in a hospital setting or at home, administrators or family members can influence how the death is categorized. Even with the dodgy data, studies that have been conducted overwhelmingly show physicians die by suicide at a higher rate than the general population. A recent review of studies published in the past decade found the rate of physician suicide was between 28 and 40 per 100,000 compared with the overall rate in the general population of 12.3 per 100,000. “In almost every one of the studies, physicians come out with a higher suicide rate than the general population, that we can say with a high degree of certainty,” Moutier said. The issues with the data make it impossible to know if the suicide rate is getting better or worse. But Nasca at the ACGME doesn't think that matters. He's asked rooms full of physicians to raise their hands if they haven't had a colleague commit suicide. Rarely anyone does. “It's overpowering when you do that,” Nasca said. A major deterrent to physicians seeking mental health services is fear they will lose their medical license. In 2013, 43 states asked questions about mental health conditions on medical licensing applications for physicians seeking a license for the first time. States were also more likely to ask about past mental health conditions than questions about past physical disorders. Disclosing a mental health issue can have humiliating consequences. The Medical Licensing Board of Indiana put Dr. Adam Hill on probation for two years after he voluntarily reported a relapse during a recovery program for substance abuse. Hill said he felt “publicly shamed” by the experience. His medical liability insurance also skyrocketed. 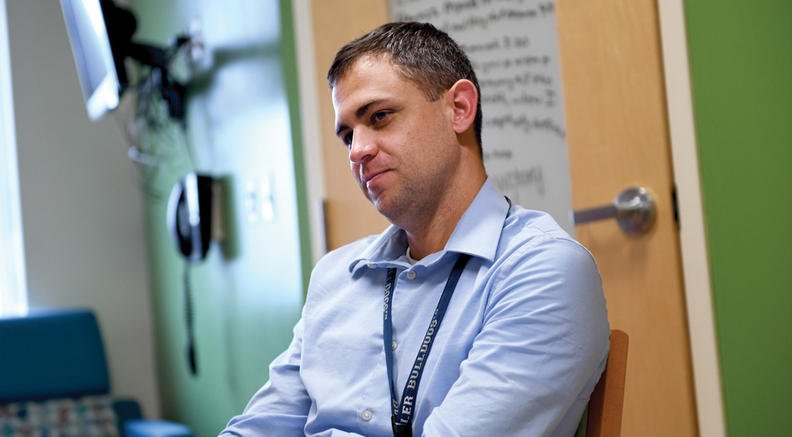 A palliative-care physician at Riley Hospital for Children at IU Health in Indianapolis, Hill has recently been open about his issues with depression and alcoholism. And he admits he's had suicidal thoughts. But there are movements to address the problem. Earlier this year, the Federation of State Medical Boards issued recommendations that boards remove questions on applications that ask about past or current mental health conditions. And for state boards insistent about asking mental health questions, the FSMB recommended boards phrase it more generally to “any condition” the physician currently isn't treating that could impair their ability to practice. In following this recommendation, a physician wouldn't have to disclose a mental health condition they are seeking help for. But FSMB CEO Dr. Humayun Chaudhry readily points out these are just recommendations. They can't force a state medical board to follow them. “Our preference would be that they don't ask the question at all,” he said. “We don't want the licensing process, which is there to protect the public, to add to the stigma that doctors seem to have about seeking care. That is not the purpose of the state boards. It's to protect the public but to do so in a manner that is sensible and reasonable and is ultimately going to help everyone,” he added. Some state boards have opted not to ask any questions about mental health. North Carolina recently removed any questions about mental health conditions from its medical licensing renewal application. Instead, a statement has been added advising physicians to seek treatment for conditions that might affect patient care. The board is in the process of adding it to first-time applications as well. Also, like 45 other states, North Carolina has a health program that allows physicians to receive mental health treatment anonymously. When the mental health question was still on the application, physicians who were seeking treatment through that program didn't have to disclose it to the board. “If people have a safe place to go where their license won't be in potential jeopardy, they will take that step forward and ask for help and that's evidenced by the fact that 45% of our participants are anonymous to the board,” said Joseph Jordan, CEO of the North Carolina Physicians Health Program. Medical license applications are just one piece of the puzzle to attack the stigma around mental health disorders in the profession. Physicians still struggle to talk openly about depression and other behavioral health conditions with their colleagues because of fear they'll be judged. But there are anecdotes that show such fears might be misplaced. When Weinstein returned to Jefferson Health after a six-month leave of absence, he decided he'd be honest about where he'd been before rumors could swirl. After years of hiding his depression from colleagues, they embraced his story. Weinstein received emails from co-workers talking about their own experiences or of those they knew who suffered from mental illness or committed suicide. Some institutions are trying to normalize the prevalence of mental health conditions among its physician workforce. When residents arrive at Mayo Clinic they are immediately told about the issue of mental health in the profession and why physicians might be reluctant to seek care. Residents are then informed about confidential counseling services available. Mayo has offered counseling services to its staff for over 20 years, but they weren't actively promoted until about two years ago, said Dr. Sandra Rackley, medical director of trainee well-being at Mayo. “Most physicians wait until they are in a crisis when they reach out for help,” she said. “We have ensured there is infrastructure within all institutions (accredited for residency programs) to provide support to begin to address this issue,” Nasca said. The Association of American Medical Colleges, which represents all U.S. allopathic medical schools, is also encouraging schools to offer and promote mental health services for students and faculty. Some schools are even breaking their classes up into smaller groups so the students can forge closer bonds with faculty and each other. “I think that sense of community support is very valuable,” AAMC CEO Dr. Darrell Kirch said. Hill at Riley Hospital said the growth of physician wellness programs and increased access to mental health resources are all good signs, but he emphasizes they aren't enough.